Good morning! Happy Super Bowl Sunday! Catching you up from last night…. I marinated two tilapia filets. The marinade included 3 Tablespoons lower sodium soy sauce, 1 Tablespoon honey, 1/2 teaspoon garlic powder, and 1/4 teaspoon ground dry ginger. 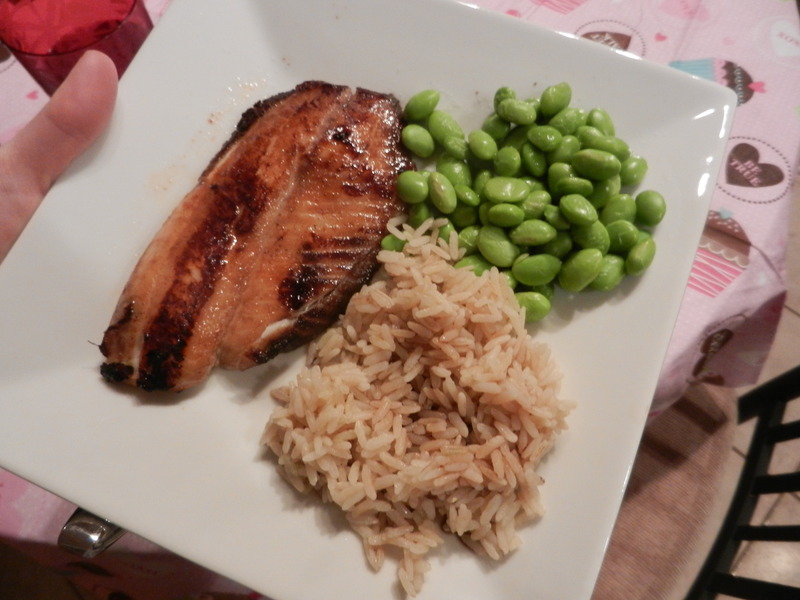 We served the honey soy tilapia with some mukimame (also a soy product!) and some brown rice with soy sauce. It was a soy kind of a dinner I guess. Ha! The tilapia turned out wonderfully. I usually need to put some kind of sauce on my tilapia, but I didn’t with this recipe. It was so easy too! Give it a shot. It was a light dinner because I knew we would be snacking and having a couple of cocktails later at my aunt and uncle’s. 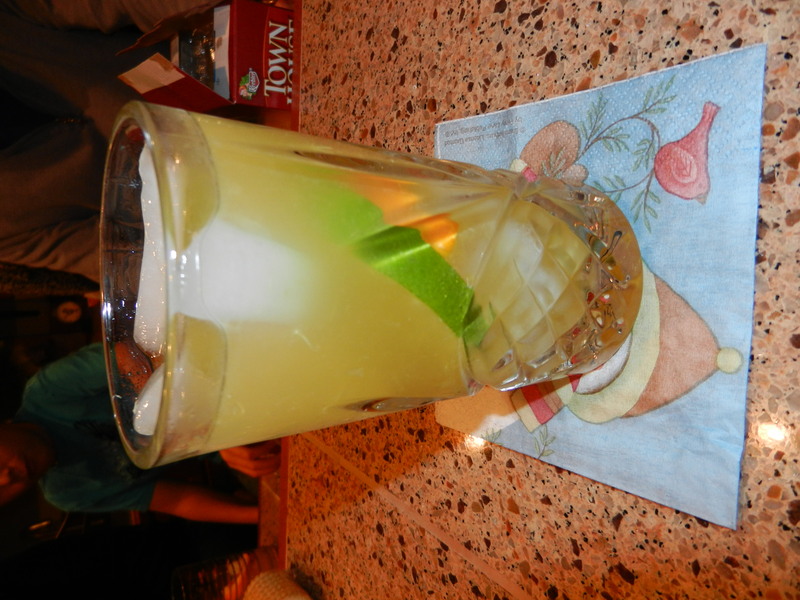 Upon arrival my uncle made me one of his famous margaritas! 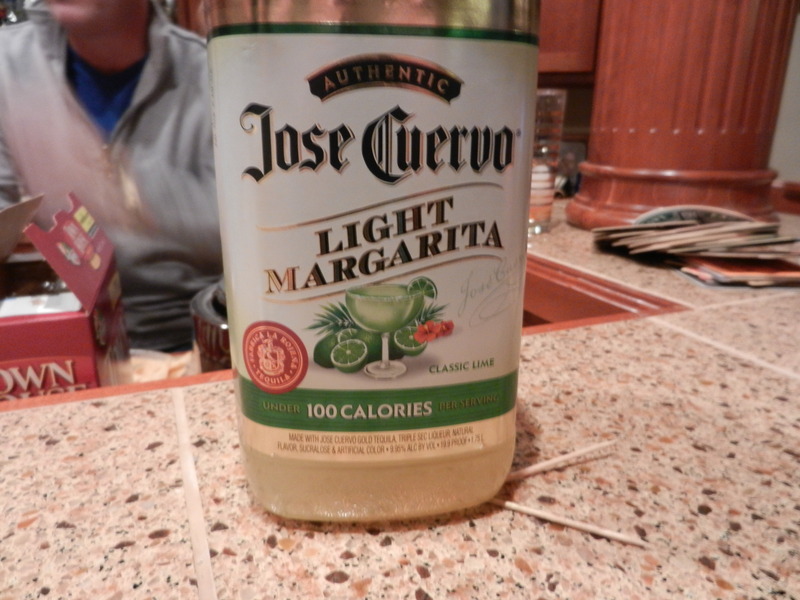 He used light margarita mix with a splash of orange juice so really he made us “skinny” margaritas. I truly appreciate that since I am trying to watch my waist a little bit these days! I also snacked on some chips and cheese and crackers with a light cream cheese spread. I negated the skinny margarita with the chips and cheese, but I don’t care. I enjoyed every bite of the salty snacks. We had a great time visiting and catching up with my mom and dad, my aunt and uncle (Chip and Patti), and their kids. It is always so great to see them. I have the best family! First off, I love Sunday mornings. I especially love Sunday mornings when I know I don’t have much on the agenda for the day. I started my morning off on the right foot by heading down to the treadmill for a quick two-mile run. After that I through a load of laundry in the wash, folded clothes from the dryer, went through a bin of old clothes from the basement, clipped coupons, and eventually came around to making myself some breakfast. 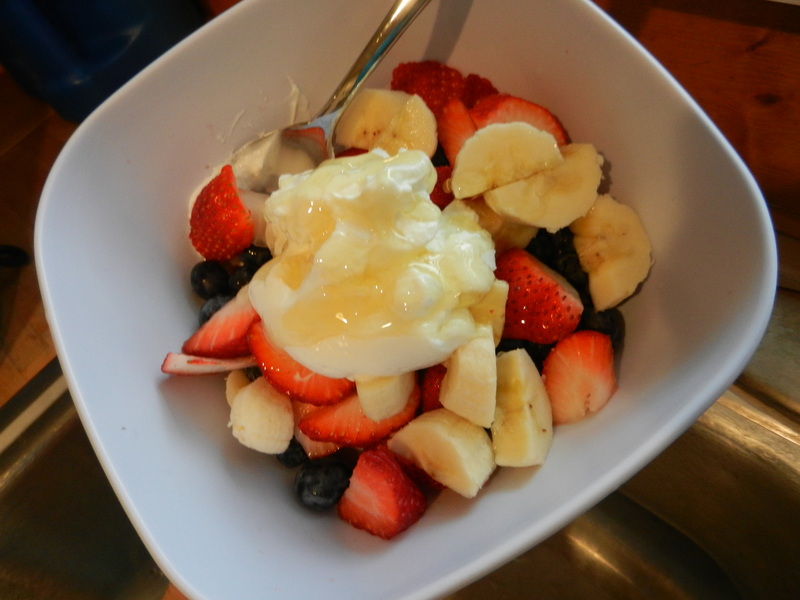 Fresh blueberries, strawberries, and banana topped with a dollop of greek yogurt sweetened with honey. It tasted like dessert it was so creamy and sweet. Next on the agenda will be finding an at home strength workout on Demand. I am hoping to find a lower body workout including lots of squats. Make it burn baby! I am in a productive mood today. Super bowl plans include staying home with the boys and snacking on some real good treats. I am not the type of person who can sit and watch the whole game, so it will be nice to be home so that I can get some stuff done around the house. I’m hoping this will include going through some more bins in the basement. I am not a hoarder but I do have a lot of junk that I do not need. Like Dana says, “just let go.” I need him with me when I’m going through my old clothes so he can help me justify why I DON’T need that swimsuit anymore that would most likely cover only one half of my behind. Kidding, but seriously, I do have a hard time letting go of old clothes. We will see if all of these things actually get made. I also want to make up a batch of tomato soup to have for a week night meal this week. It sounds like I will be in the kitchen all day. I LOVE IT! I am feeling ambitious. I feel like someone injected a triple espresso into my bloodstream. I better stay on top of this. I will be sharing ALL of these recipes with you once I have developed them! 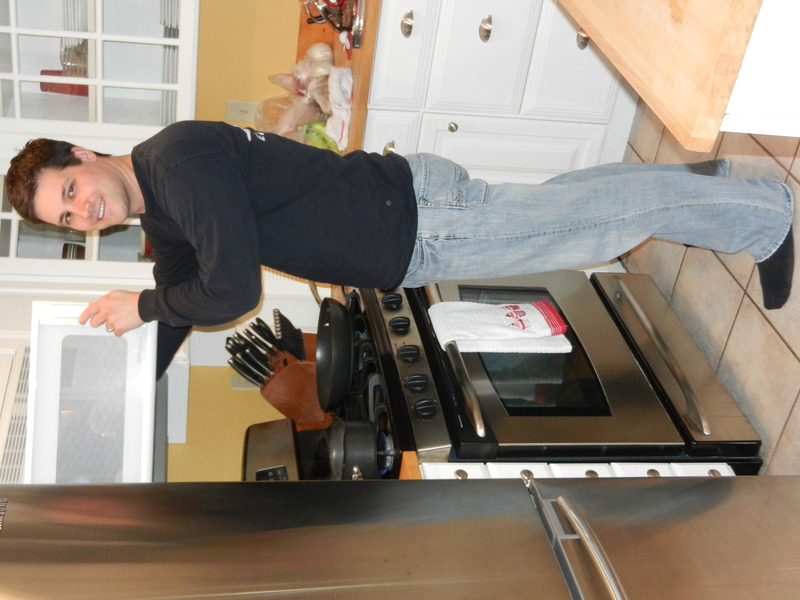 I am excited to get creative in the kitchen. Have a wonderful Sunday everyone! Much love to all! This entry was posted in Breakfast, Dinners, Family, Home Life, Snacks and tagged fruitbowl, margarita, Snacks, superbowl, Tilapia by Melanie. Bookmark the permalink.